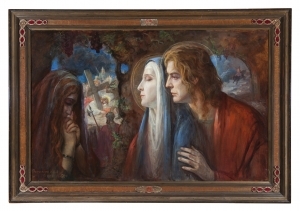 The Symbolist Dutch Painter Antoon van Welie (1866-1956) was also a draftsman and well-known portrait painter - in 1900s, Antoon van Welie was very popular as a portraitist of the elite in Europe, when he lived in Paris, London and Rome. Among his famous clients are the Popes Pius X, Benedict XV and Pius XI, the actress Sarah Bernhard, the dancer Isadora Duncan. In the Netherlands his sitters include members of the royal family Prince Hendrik, Princess Juliana and Prince Bernhard. In 1921, he became the Knight of the Legion of Honor.